How HR Managers can Design effective Employee Review Process? Home » How HR Managers can Design effective Employee Review Process? » Blog » How HR Managers can Design effective Employee Review Process? To conduct an effective employee review in a timely manner is an important responsibility for HR. 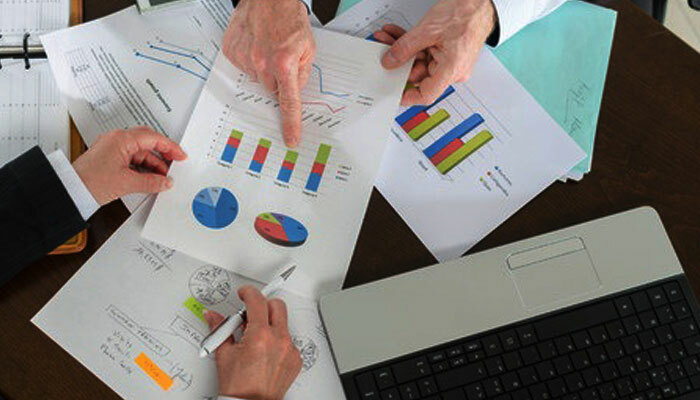 HR Function is the owner of the performance appraisal process in an organization. The performance appraisal process is linked to many important outcomes such as increments, training, promotions, confirmations, job rotations and even exit and is one of the core employee development related activities. During the execution of the employee review processes, HR faces the challenges of communication and training, tracking and follow-ups, normalization and managing expectations. Many of these challenges can be addressed by designing a relevant performance appraisal software. In this blog post, let us understand how Empxtrack Performance Appraisal helps HR to set up an effective employee review process. This blog is a series of blogs that deal with Effective Performance Management. You can read about the previous blog here. Empxtrack, through its performance appraisal software, allows the HR Function to develop a comprehensive form based appraisal that captures all the key inputs required for the successful execution of the performance appraisal process in your organization. Availability of multiple Appraisal Templates: Defining the relevant inputs is a key to an effective appraisal. 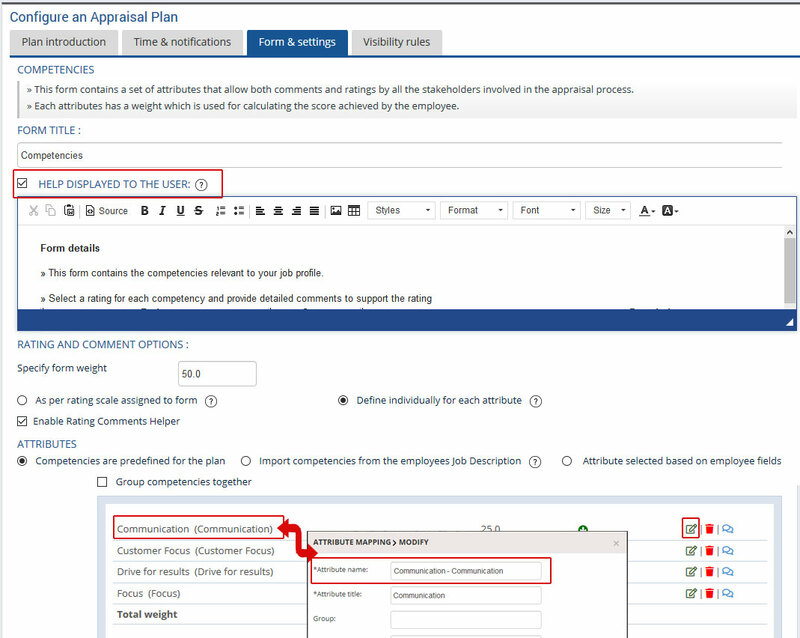 Empxtrack offers HR Managers a number of predefined templates that can be customized according to the specific needs of your company, as shown in Figure 1. Each template contains options for setting attributes, ordering them in the desired layout, setting mechanisms for capture of scoring and also setting up a help on each page to help the user understand the nuances of each form. 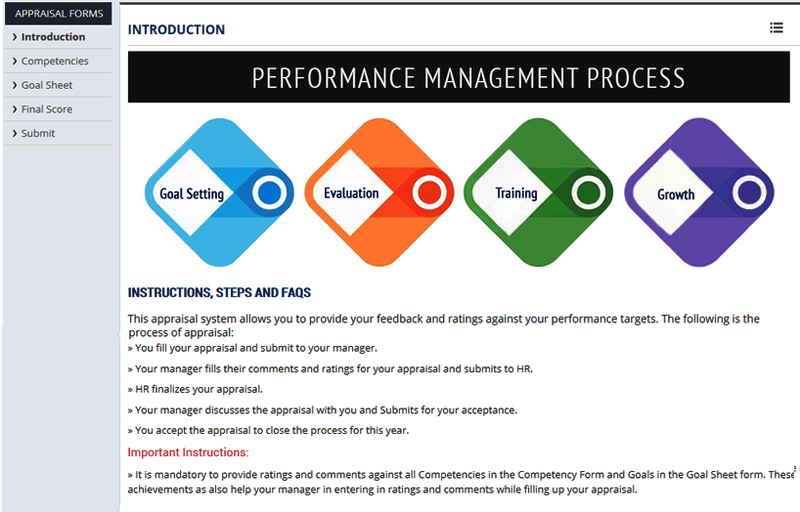 There are various pre-defined templates in Empxtrack performance appraisal module to help you quickly setup the relevant inputs and include Introduction, Self-Appraisal, Employee career profile, Competencies, Goal sheet, Transfer/Promotion recommendations, Salary recommendations, 360 Feedback, Relative Ranking, Final scores, Final Score & Submit, Performance Improvement Plan and many others. Empxtrack allows to setup multiple versions of the templates (eg. Multiple competency templates) that can be allocated to different groups of employees.You can create different appraisals for different employee groups through a unique concept called Appraisal plans. 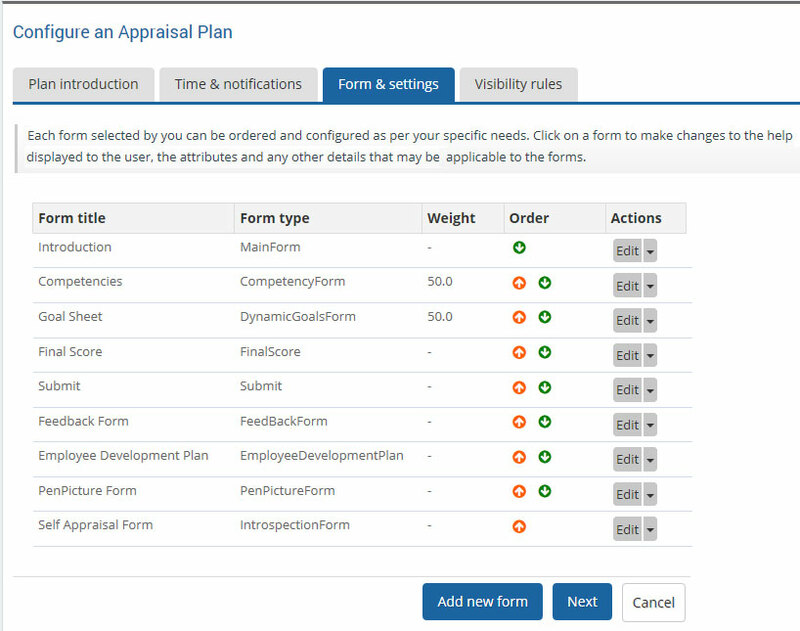 An appraisal plan combines a group of employees, a set of forms and scoring logic into a unique set allowing a completely unique type of appraisal for a group of employees. For instance you could have a Sales Appraisal Plan, a Confirmation Appraisal Plan and an Annual appraisal Plan. Identify appropriate stakeholders: In many companies only the manager provides a feedback on the Employee. Empxtrack’s Performance appraisal encourages inputs from multiple stakeholders including the Employee, Manager, Managers-Manager (or reviewer), Head of Department (Director) and even CEO for the employee review.Empxtrack appraisal module allows you to identify all the employees who will be involved in the Performance Appraisal process, their visibility and access rights at each stage and the inputs they are allowed to make on each form. This allows HR to involve multiple employees, yet maintain complete confidentiality in ratings and comments till the final results are shared. Communicate the process: Most employees and managers do not understand the employee review process completely and hence the inputs captured by them may not meet the HR and company need.Empxtrack helps by providing a special form called the Introduction form on which you can communicate the details of the process, share the expectations and also set the Appraisal calendar. Refer to the template of the Introduction form in Figure 2 below. This template can be setup by you and our HTML editor allows you to even paste in Word documents for a Rich look and feel. Customize Employee Review Forms: HR can choose the forms that they want to use and customize the forms with desired label names, attributes, rating scales, visibility rules, order of display and edit permissions. Figure 1 shows how the title of the forms can be changed and Figure 3 shows how each form can be configured. You can change the help text, attributes and rating scales to be used on the forms. Get Feedback from multiple employees: While most employees work under a single manager, there are many companies that have Matrix structures or employees have multiple reporting managers (dotted managers). In such cases, it is important to get a feedback from each dotted manager, subordinate, senior and even external parties such as vendors or customers. Empxtrack allows this through a special 360 Appraisal template. The 360 template allows Managers to initiate a feedback to any number of people and allows the manager to select attributes and goals. Set Automatic Reminders: Delays in completion of the performance appraisals affects the outcome of the entire process. To finish employee review in time, HR has to identify the bottlenecks and repeatedly call managers and employees with reminders.Empxtrack allows HR managers to auto schedule performance appraisal dates and set reminders for the managers to complete the process in time. 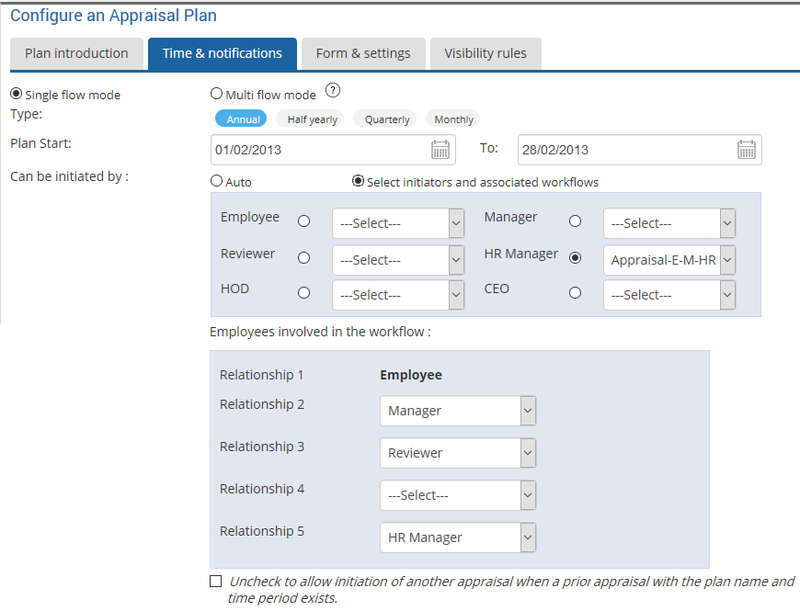 HR can even set the option to move the appraisal to the next stage if no action has been taken after certain number of reminders, as shown in Figure 4. Through various appraisal templates, customization of Performance appraisal forms and automatic reminders Empxtrack Performance management modules assists HR managers to communicate the employee review process effectively and conduct effective and timely performance appraisals with ease. In the next blog in the Performance Management Series of blogs, we will discuss how Empxtrack Performance Appraisal module assists managers to conduct an effective feedback session using employee review at the end of the appraisal.